Scientists clone glow in the dark pigs using jellyfish DNA. Scientists in China have successfully bred glow in the dark pigs using jellyfish DNA. Researchers at the South China Agricultural University announce last month that they had successfully engineered 10 piglets that glowed green under a black light. The scientist said the technique pioneered by the University of Hawaii at Manoa School of Medicine could help create more cost-effective medicines and therapies to treat patients with certain maladies. “Patients who suffer from hemophilia, and they need blood clotting enzymes in their blood, we can take and make those enzymes a lot cheaper in animals instead of in a factory that will cost millions of dollars to build”, said Dr Stefan Moisyadi, of the University of Hawaii Institute for Biogenesis Research. The scientists isolated a fluorescent protein in the jellyfish DNA, which they injected into the pig embryos. The pigs are expected to live a normal life span. The researchers said their success rate for breeding the piglets, including six born August, was quadruple the previous success rate for transferring plasmids carrying the fluorescent protein to the embryos. 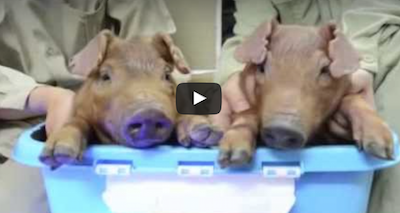 In the video released by the research team, the piglets initially squealed in fear as the lights are turned off, except for a black light that illuminates their bodies green tint. “The color is just a marker to show that we can take a gene that was not originally present in the animal and now exist in it”, Moisyadi said. “The green is only a marker to show that it’s working easily”. Researchers in Turkey have already use the technique to breed fluorescent rabbits, and they are expected to announce similar results for sheep Scientist at the Audubon Center of Research of Endangered Species have cloned glow in the dark wildcats in hopes of saving that species from extinction.